This is a sponsored post. However, my opinions are honest opinions. This post is one of the hardest posts I have written. It is going to be really raw and I am going to share parts of me that many of you do not know. 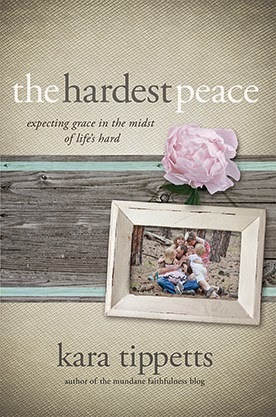 I recently was asked to review a book called, "The Hardest Peace". This book is such a wonderful book! Why is this post so hard to write then? Keep reading. Kara Tippetts knows the ordinary days of mothering four kids, the joy of watching her children grow...and the devastating reality of stage-IV cancer. 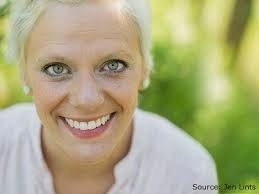 Kara Tippetts and her husband, Jason, have four children and are planting a church in Colorado Springs, CO. Cancer is only part of Kara's story. Her real fight is to truly live while facing the crushing reality. She blogs faithfully at mundanefaithfulness.com. When I was presented the opportunity to read this book there were many things that went through my head. I did not know if I should do it. The main reason for my concern was that about a year and a half ago I went through one of the hardest trials I have ever had to live through. If you know me I have had a few, but this one topped it all. I still struggle to this day with it. I do not even know what to call this trial, but I will say this. As I have talked to many people and some of them professionals I believe I was going through a nervous breakdown. I did not even think those were real, but I am telling you they are and they are awful. This trial could be a completely different blog post, but I will just say this...much time during this "nervous breakdown" I spent crying and curled up in a little ball just...surviving. The main cause of this was my fear of cancer. I have no idea why. I have this fear and it might sound silly to some, but to me it is real and it is crippling. My husband lost his mother to cancer almost 10 years ago. That might have something to do with it...I don't know. Now do you see that I thought long and hard about if I should read this book. As you read the description of the book above you know what it is about. I didn't know if I was strong enough. I didn't know if I should protect myself. I did not want to go into that deep, dark hole I was in last year. To make matters worse, I just lost my aunt to cancer. So this was a really raw topic for me to read about and I knew that this woman was going through my WORST nightmare. My living hell. However, this book promised peace. I mean, it is in the title of the book! Although, as I write this blog post I still hold that real fear and I still struggle with it daily, this book DID bring peace. It did help me see things in different ways or if not different then it reaffirmed my thinking. Kara writes this book in a way that is so helpful. By that I mean the structure of the book is fantastic. She has a general topic for each chapter. Intermixed in each chapter are scriptures and inspiring quotes. Then she concludes each chapter with a set of 5 questions to ask yourself. She does this because she wants to make her story yours. She wants to help others. I want to share a few of my favorite quotes from this book so you can get an idea of what the book offers. The first one is said MANY times in the book. It is so powerful and very short. That quote is, "I am not the Author of my story." How many times do we want to write our own story. I do! However, that is where faith comes in. I need to have faith that our Father in Heaven knows what is best for us. Each of us individually. The next one is a quote from her husband that he gave during a sermon, "We want suffering to be like pregnancy-we have a season, and it's over, and there is a tidy moral to the story." Kara then follows with, "I've come to sense that isn't what faith is at all. What if there is never an end?" We all want suffering to come to an end and to be shown exactly WHY we had to go through it. That isn't always the case. That isn't faith. The next one is in the middle of the book. It is one of the inspiring quotes that Kara puts within the text she writes herself. The quote is from Nancy Guthrie, Holding on to Hope, "But because I believe God's plans for me are better than what I could plan for myself, rather than run away from the path he has set before me, I want to run toward it. I don't want to try to change God's mind-his thoughts are perfect. I want to think his thoughts. I don't want to change God's timing-his timing is perfect. I want the grace to accept his timing. I don't want to change God's plan-his plan is perfect. I want to embrace his plan and see how he is glorified through it. I want to submit." I hope one day to have that attitude. I will say there are days that I do. There are moments that I do, but I guess I am human...so I fail at times. This quote really hit home for me. The next quote is from the same source, Nancy Guthrie, Holding on to Hope: "Trusting God when the miracle does not come, when the urgent prayer gets no answer, when there is only darkness-this is the kind of faith God values perhaps most of all. This is the kind of faith that can be developed and displayed only in the midst of difficult circumstances. This is the kind of faith that cannot be shaken because it is the result of having been shaken." Again...that is the kind of faith that I have been striving to have through this last year and a half of my life. Everyday is a different day and I can be a little better than yesterday. Kara says in her book, "This is also not only a book to hand to someone who has been recently diagnosed with cancer, though I hope I could encourage many on that journey. This is a book for all of us, because all of us face the hard edges of life,..." Kara does this. She helps you see things in a way that you might not have seen them before or if you have then she reaffirms your thoughts. This is a book that everyone needs and should read. It will strengthen you in so many ways. I feel so close to Kara even though I have never met her. Luckily for you I have one to giveaway! Disclosure: Many thanks to Propeller Consulting, LLC for providing this prize for the giveaway. Choice of winners and opinions are 100% my own and NOT influenced by monetary compensation. I did receive a sample of the product in exchange for this review and post. Please see other Terms by clicking the "Terms and Conditions" link below. That was a very good review. I am glad that you were able to face a fear that you have by reading this book. Life is a precious gift that we should never take for granted. One of my best friends is in her final stages of cancer and I really struggle to accept it. I know that Jesus is the only one who can inspire me. Maybe this book would help as well. Thanks, Sandy B. My son with special needs! He is amazing! I am so so sorry. This book helped me in ways I did not know was possible. I hope it can do the same to you! I think many people with special needs are an inspiration. They truly amaze me. That is so awesome that your son can inspire you!